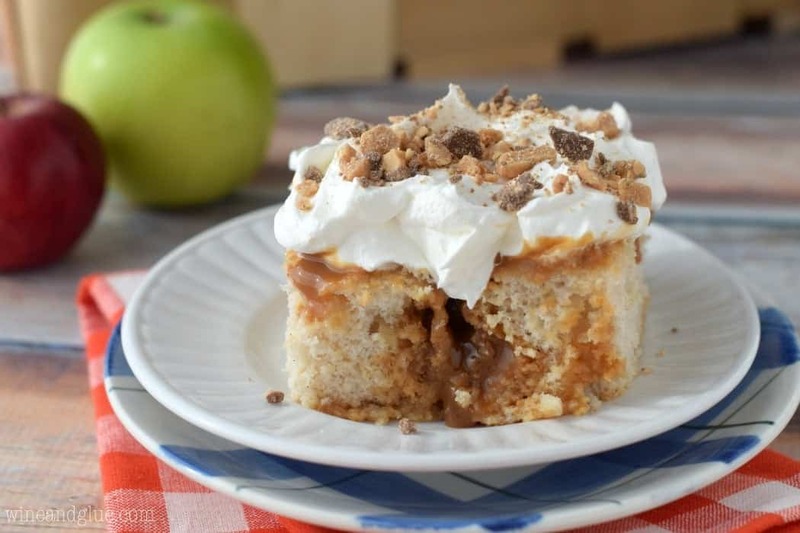 A Caramel Apple Poke Cake that is easy to make, but super addictive! Try not to eat the whole pan. 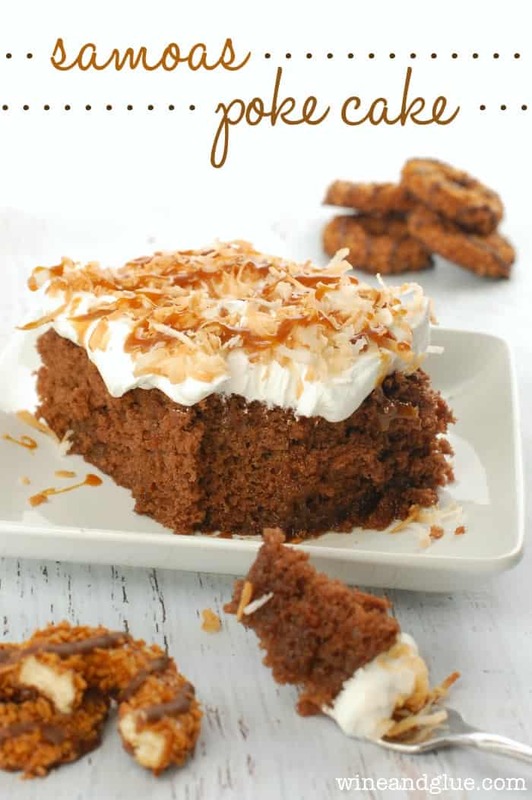 This caramel poke cake recipe is going to be your new go to dessert for family get togethers. If you are looking for other great caramel apple inspired recipes you are going to want to try this Caramel Apple Sangria and these Caramel Apple Bars. 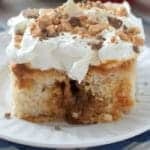 For more great poke cake recipes make sure you check these, More than 30 Poke Cake Recipes. Guess what’s more frustrating than trying to herd cats? Trying to use logic and reason on a three year old. It’s like she literally knows the exact thing that I want her to say and picks the opposite. “Why.” has become her new favorite stalling tactic. It has become the answer to every statement of fact I give her. It has become the beginning and end to every argument between us. In short, it has become my least favorite word in the English language. As is typical of my three year old, just when I’m about lose it with her and say something regretful and . . . . okay, mean, she does something hilariously awesome. Like as I was walking over to the most perfectly lit spot in my house with this piece of perfection and she comes trailing after me saying, “Mom . . . . is that cake?? ?” all singsongy. Super adorable. Not only that, but she understood that she had to wait until I got a great shot of said cake before she could taste it. And then when she did taste it she proclaimed, “Ooooooo, that’s tasty! !” And all was forgotten and forgiven. Well . . . until she said, “Can I have more? ?” and I promptly told her no. 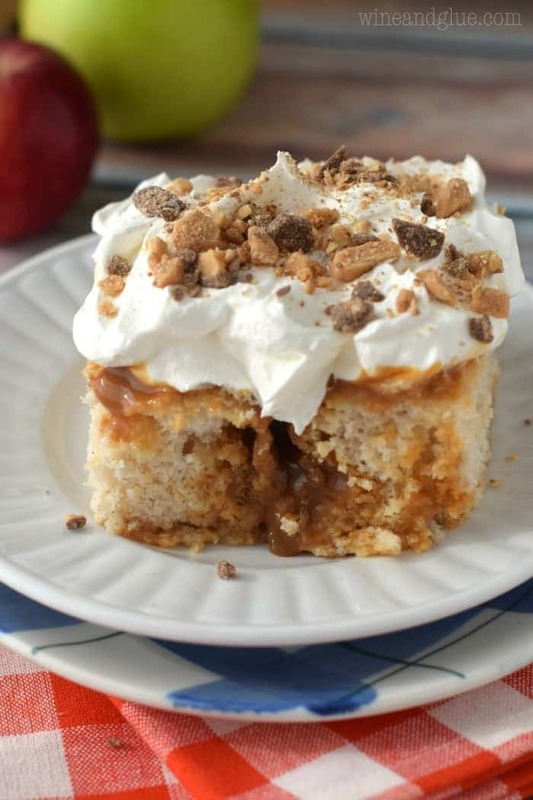 A Caramel Apple Poke Cake that is easy to make, but super addictive! Try not to eat the whole pan. 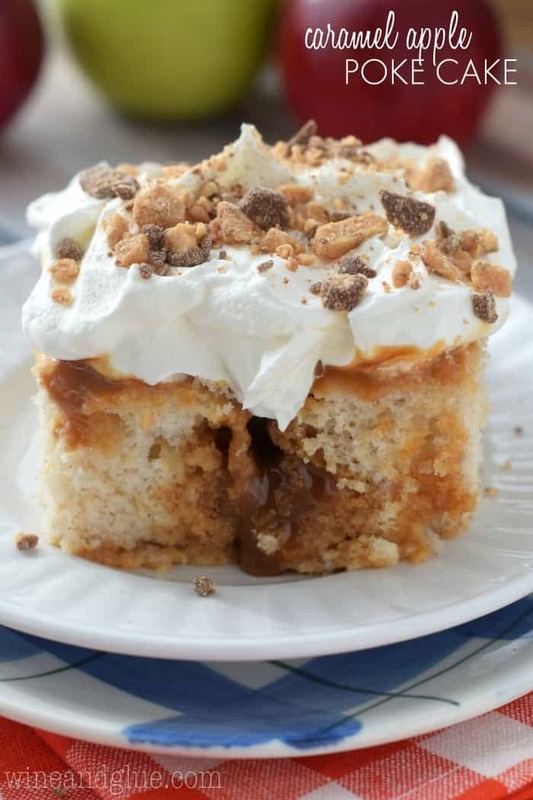 This caramel poke cake recipe is going to be your new go to dessert for family get togethers. Preheat your oven to 350 degrees. Grease a 9 by 13 inch pan, and set aside. In a large bowl, mix together the cake mix and cinnamon. Mix in what the cake mix calls for (see note regarding adding oil) and vanilla extract. With the apples still in their can, stick a knife in the can and cut up the apples making them smaller chunks. Then add the whole can to the cake mix. Pour the batter into the greased pan. Bake for 30 minutes. Let the cake stand for about 10 to 15 minutes. Then poke holes with the bottom of a wooden spoon throughout the cake, about an inch to two inches apart. Warm the caramel sauce in the microwave so that it is easier to pour. Pour over the cake into the holes, making sure some sauce gets into each hole. Refrigerate overnight. Before serving, top with whipped topping and toffee bits. The cake mix that I used called for egg whites and oil. I ended up eliminating the oil because of the apple pie filling. However, if you use both your cake will be just fine. Three year olds somehow manage to be both the best and the worst, all at the same time. I kind of miss having one around. I totally love her “why.” ending with a period. I feel like that is my answer to my inner-adult, who is always advising me not to eat pizza and maybe go for that run 🙂 This cake looks so dreamy!! This cake looks SO good, Lisa! LOVE the toffee bit topping. Pinned! Julie, I could eat those toffee bits by the BAGFUL! Thanks for pinning! It’s like they’re born with the opposite ability. SO annoying. This cake? Not annoying. LOVE it! Cake perfection. Especially for caramel apple addicts like myself 😉 Pinned girl! I miss having a 3 yr old in the house. Because when my 17yr old asks “why” it’s scary. LOL. Can’t go wrong with cake for breakfast and wine for dinner! Love this recipe! Apples definitely make this breakfast! Oh my gosh, I would NEEEEEED a big slice of this cake to get through the “why” stage. I hope you enjoyed it Chris! I made this today for family and they loved it! I should have made it last night, but I was tired. It was still delicious, but I bet it’s even better after letting it sit. So glad you and the family liked it Billie! Do you beat the egg whites slightly before adding them to the cake mix? I didn’t Kathy, and it turned out just fine! The video shows whole eggs, but the recipe calls for egg whites???? Yeah, so the difference is that I used a different cake mix that called for a different number of eggs. You basically need white cake mix and what it calls for. ???? This tastes terrific! Thanks for the recipe. I just made this for a Halloween party and everyone loves it! its so flavorful but light and was easy to make! Do you have any tips that could help me make a homemade caramel sauce? 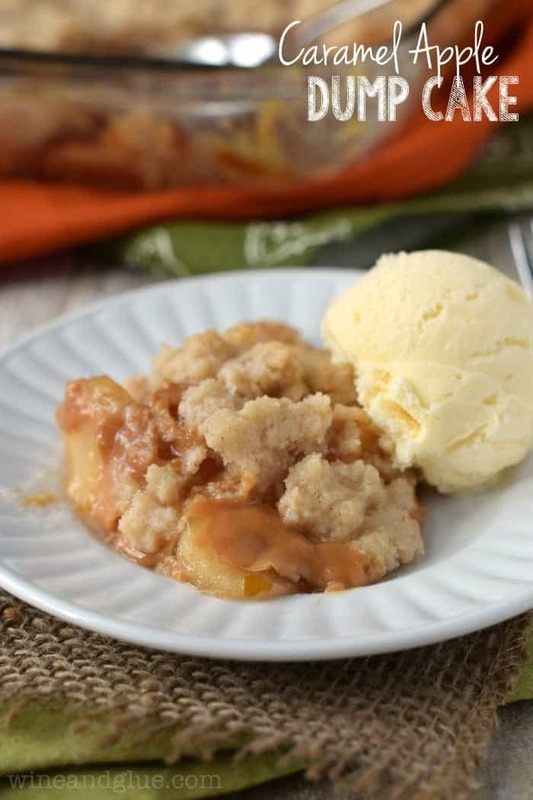 Check out the caramel sauce I make in my Caramel Apple Cobbler!